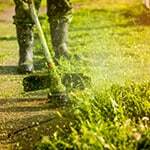 Home » How-To Library » What Are 2-Cycle and 4-Cycle String Trimmers? What's the difference between 2-cycle and 4-cycle trimmers? It’s not just the price, although you've probably noticed that 2-cycle string trimmers cost less than 4-cycle trimmers, but string trimmers differ in the ways their engines operate. Understanding those differences can help you decide which kind of gas string trimmer is right for you. So, How Do 4-Cycle Trimmers Work? 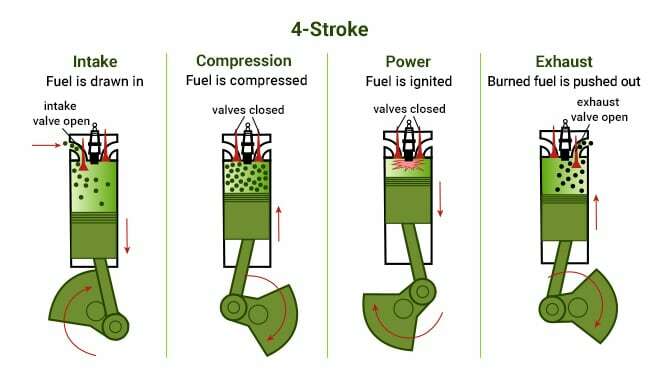 In the diagram below, you can see what happens during each of the engine's cycles. The cycle refers to the number of strokes a piston completes in a combustion engine. A 4-stroke string trimmer produces far fewer emissions, impacting the environment less and improving fuel efficiency. In fact, in some states, you might have to use a cleaner-running 4-stroke trimmer due to emissions regulations. That increased fuel efficiency of a 4-stroke model is an attractive benefit on the consumer level, too. You'll use less gas, which saves you money and time refueling. Plus, when your parts produce fewer emissions, they tend to produce less noise as well. This is true in the case of 4-stroke trimmers. Another benefit of a 4-stroke engine is the extra torque it provides. Torque is the force that turns an object around an axis, such as an engine’s crankshaft. Unlike 2-strokes, which generate more power by operating at higher RPMs, 4-stroke engines generate more power through greater torque. 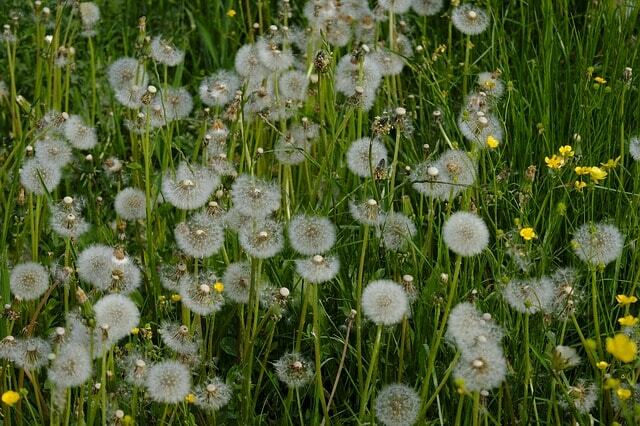 In other words, while a thick cluster of weeds might slow a 2-stroke trimmer down, the regulator inside a 4-stroke trimmer's engine will be able to use torque to keep the trimmer operating at a consistent level of power. 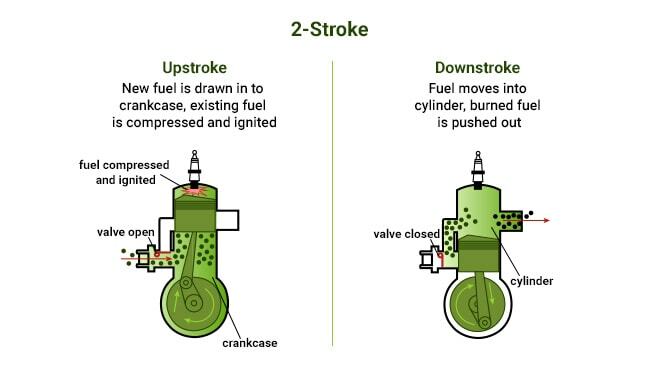 A 2-stroke engine cuts the number of strokes in half by combining the compression and ignition on its upstroke while combining the power and exhaust on the downstroke. With fewer moving parts, 2-stroke string trimmers are dependable tools. They weigh little and vibrate less than 4-stroke trimmers, which reduces operator fatigue and makes for a better trimming experience. They also require less maintenance. With 2-stroke engines, you mix oil with the gas in the fuel tank, which makes an oil change for your string trimmer a thing of the past. In fact, the only two regular maintenance tasks you’ll have to worry about are changing the strings and emptying the fuel tank for the off-season. In most cases, you can even store a 2-stroke more easily, too. Because some older 4-stroke trimmer engines store their oil in a chamber that’s separate from the fuel tank, they have to be kept level in order for the oil to properly lubricate the engine’s moving parts. A 2-stroke trimmer uses that gas-and-oil mixture, so it can be hung or tucked away on a shelf without concern. Now that you know the differences between a 4-cycle and a 2-cycle string trimmer, you may be excited to choose one and get trimming. We don’t blame you! However, there's a lot more that goes into picking the perfect string trimmer than choosing between a 4-cycle and a 2-cycle. There are differences in features, power, shaft style, trimmer head style, and more. To make choosing the right string trimmer easier for you, we've created a comprehensive guide to help. 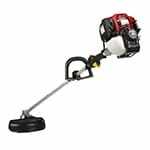 Click the link below to proceed to the Gas Handheld String Trimmer Buyer's Guide, and find the absolute perfect string trimmer for your trimming needs. 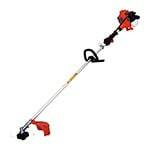 What Are 2-Cycle and 4-Cycle String Trimmers?.. Our Power Equipment Direct how-to library can help you learn about How to Measure Cordless String Trimmer Power, Straight Shaft vs Curved Shaft String Trimmers and 2-Stroke vs 4-Stroke String Trimmers.